Complete copper-alloy sheet-metal bell, perhaps from human dress, or a dog, hawk or horse harness. 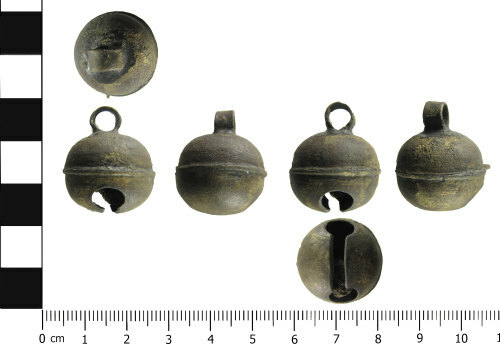 The bell is made of four constituent pieces. The two halves are made from hammered copper alloy sheet and soldered together at a ridged seam running around the circumference. The suspension loop is made from a flat rectangular piece of copper alloy sheet, and has been inserted into a hole in the top of the bell. This hole has since been covered with solder to secure it in place. The sheeting forming the body of the bell is enclosed around the fourth element, an iron pea, which is still present, though heavily rusted. Despite this, the bell still rings as the pea is not attached to the inner surface of the copper alloy sheeting and so is able to move freely. The sounding slit and two circular holes have been cut into the bottom half of the bell. The straight edges of the sounding slit are slightly bevelled. The surface of the bell shows traces of gilding. Dimensions: weight: 2.31g, diameter: 19.2mm, height: 22.9mm. A similar example dating to the late 15th century can be found in Egan and Pritchard, 1991: 338-9, number 1666. They do not appear to have come into fashion until the late 14th century (Egan and Pritchard 1991, 336) and were perhaps in common use into the early post-medieval period. A comparable example on the database is KENT-F84FB5.